Tesla’s Model 3 electric vehicle may be in trouble yet again. This time, it’s for a series of OSHA violations. A report issued recently by the Center for Investigative Reporting (CIR) has prompted Cal/OSHA to look into possible workplace safety violations. Cal/OSHA will be looking into the Tesla assembly plant in Fremont, California. According to the CIR study, the company has failed to accurately document and report serious workplace injuries on several occasions. Under Cal/OSHA regulations, all serious injuries must be reported to OSHA on Form 301 and recorded in an OSHA 300 Log within eight hours of each accident. Serious injuries or illnesses are defined as (a) incidents requiring hospital stays of more than 24 hours, (b) when a body part is lost, or (c) when an employee is permanently disfigured. 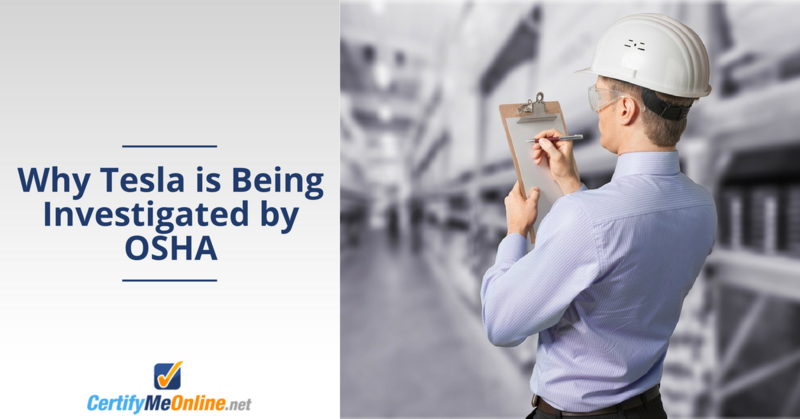 Employers who knowingly or repeatedly violate OSHA regulations can be fined up to $70,000 for each intentional breach of these requirements. Maintaining accurate and up-to-date records is important since Cal/OSHA inspections routinely include a review of the employer’s 300 Log. Companies with ten or fewer employees throughout the previous year and some low hazard businesses such as banks, medical offices or restaurants are generally exempted from OSHA’s injury reporting requirements. Workplace incidents that result in a death, hospitalization, amputation or loss of an eye, must be reported within eight hours even if the company is typically not required to keep a 300 Log. Tesla recently announced plans to start producing Model 3 vehicles around the clock, seven days a week at its Fremont plant to meet delivery deadlines. Those plans, however, might be affected by Cal/OSHA’s investigation into accusations that Tesla intentionally made their safety record appear to be better than it actually is. According to CIR, Tesla failed to report some injuries, claiming they were either minor in nature or resulting from employees’ pre-existing medical conditions. Tesla has since denied the accusations. This isn’t the first time OSHA has questioned Tesla’s safety record. During the past five years, Cal/OSHA conducted 20 investigations into safety violations at Tesla facilities, some of which were dismissed, while others resulted in fines against the company. In May 2017, workplace safety advocacy group Worksafe reported 2014 and 2015 injury rates at Tesla’s Fremont assembly plant were much higher than the U.S. industry average. Worksafe additionally found that volume of injuries Tesla reported to the U.S. Department of Labor during 2016 were also higher than the national average. Tesla, however, claims its injury rate is less than half than when the Fremont plant was jointly operated by Toyota and GM. Federal regulators recently fined Tesla more than $110,000 for safety violations following the hospitalization of an employee for severe electrical burns sustained last December. Four employees at SolarCity, a Massachusetts-based Tesla subsidiary, were working on a 13,800-volt electrical panel when one of the workers received a potentially lethal shock. According to OSHA, safety gloves issued to the workers were rated to protect them against only 1,000 volts of electricity. Although each employee had completed a required online safety class, Tesla allegedly failed to require the workers to demonstrate their ability to use the protective equipment. According to a Tesla spokesperson, the injured employee was neither authorized nor directed to work on the electrical panel that caused his burns. OSHA investigators uncovered 10 separate violations stemming from the incident, most of which resulted in fines. A Tesla spokesperson says the company plans to appeal OSHA’s findings. Federal safety regulations require that anyone who operates an aerial lift or scissor lift in the workplace must be properly trained, evaluated and certified. The responsibility of providing the certification training falls on the employer. Consequences to the employer for failing to comply with OSHA regulations can include large fines, imprisonment or both. More importantly, failure to properly train aerial lift and scissor lift operators can result in the serious injury, permanent disability or even death of an employee. The easiest and most economical way to satisfy OSHA’s aerial lift and scissor lift training requirements is through CertifyMeOnline.net. Using CMO’s OSHA-approved online training and certification programs, employees can be certified in as little as one hour. There’s no need for the employee to take valuable time away from work to attend off-site training classes; all training can be completed in-house. The employee can also choose to use a digital device such as a smartphone, tablet or laptop to complete the course at his or her convenience 24/7 anywhere there’s an Internet connection available. Once the employee finishes the training, the certificate OSHA requires the employer to keep on file and a temporary wallet card to be carried by the operator can be immediately downloaded and printed. A permanent laminated operator certification card will be mailed to the business within seven to ten days. Thousands of businesses and individuals have used CertifyMeOnline.net to train and certify their aerial lift and scissor lift operators, and at a one-time cost of just $75 per employee, it’s easy to understand why. What’s more, the CMO package includes free lifetime renewals for the operator recertification OSHA requires every three years. To get started down the pathway to OSHA compliance, contact CMO today. You’ll be glad you did!